I know, a silly play on the past holiday celebrating our independence from King George. However, much has been written on interdependence, including from such leaders as Mahatma Gandhi, Franklin D. Roosevelt, and John Muir, to name a few. 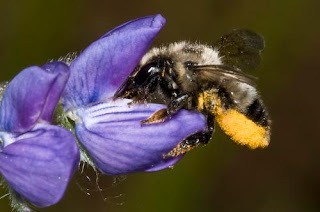 The bee and lupine in the photograph above are interdependent. The bee is dependent on the lupine for nectar while the lupine is dependent on the bee to carry the pollen to the next flower. Interdependency is everywhere, from the smallest life form to whole countries. In fact, the whole universe. About our Independence Day celebration and the Declaration of Independence. Thomas Jefferson wrote, “All men are created equal”, one of the most recognized sayings in American history. Some have claimed it was paraphrased from Philip Mazzei. Either way it was not that great of a statement since we have been trying to rectify it for 232 years! TJ was not talking about Native Americans, African Americans or even women. He was talking about rich white men that owned property and probably slaves. We have ‘adjusted’ our constitution to include women, minorities, and the handicapped. “All things are created equally important”!